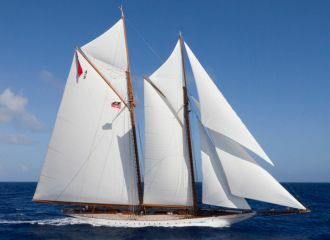 A fabulous yacht charter destination mixing natural beauty, historic charm and romance. Explore a rugged coastline with picturesque pastel-coloured houses tumbling town into the turquoise waters. The Amalfi Coast embodies the perfect Mediterranean coastal landscape: dramatic cliffs, charming fishing villages, verdant valleys… From green Ischia to vibrant Capri, a yacht charter in the Amalfi Coast is the perfect combination of beach, nature, culture and gastronomy. Highlights of a yacht charter on the Amalfi Coast include glamourous Capri, the thermal springs of Ischia, the village of Amalfi and many more. If you like history, we can also arrange a visit to the ruins of Pompeii. 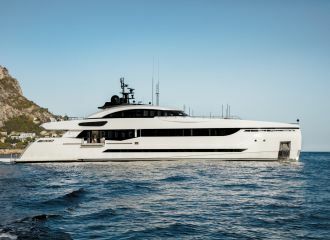 Board your yacht in Naples and cruise to Ischia. 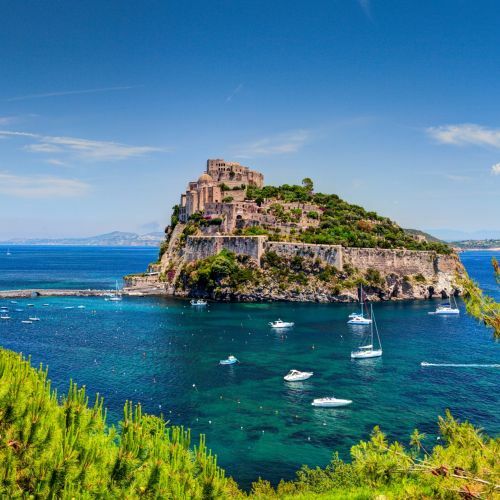 Beautiful green Ischia is a volcanic island with many natural springs as well as sandy beaches and azure waters. Spend some time ashore discovering the island and trying a thermal treatment with healing properties. 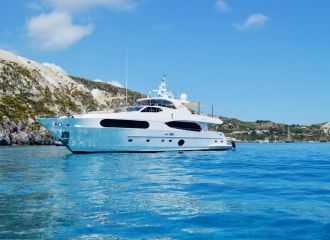 After breakfast, relax on the deck of your yacht, take a swim or do some snorkelling before heading to Sorrento. The views from Sorrento are stunning encompassing Naples, the Vesuvius and Ischia. Relaxing afternoon at anchor or ashore visiting the village. Morning cruise to Capri which overlooks the stunning bay of Naples. Capri is one of the most popular places to vacation on the Mediterranean. Take a tour to the Blue Grotto. Spend the afternoon relaxing on your yacht, swimming and enjoying the yacht’s water sports equipment. Relaxing day in Capri. Explore the town with its beautiful villas, designer boutiques and charming restaurants. Capri is a combination of rustic charm, natural beauty and bustling glitz. In the evening, try one of Capri’s exclusive restaurants. After breakfast, cruise to Positano. Built around a small bay on a steep hill, Positano is a picturesque village. Spend the day exploring Positano or swimming and enjoying water toys. Depart for Amalfi, probably Italy’s most romantic village. We recommend you take a taxi to the village of Ravello which boasts spectacular views of the coast. 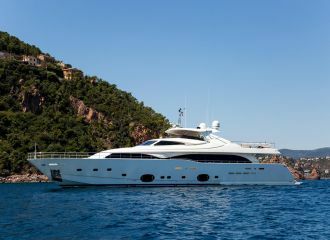 On your last day, the yacht will anchor in a beautiful bay so that you can enjoy a last swim and some water sports. Late afternoon cruise back to Naples for disembarkation.